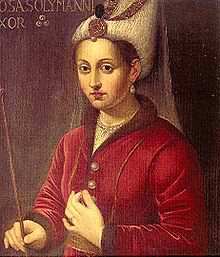 Known to the Western world as Roxelena (or some close spelling), she became Haseki Hürrem Sultan, Her Imperial Highness, Imperial Empress of the Ottoman Empire when she married Süleyman the Magnificent, the Sultan of the Ottoman Empire. Little is known of her early life. She was born in 1506 and may have been named Alekandra Lisowska, the daughter of a Ukrainian Orthodox priest in Rohatyn in what is now the Ukraine. In the 1520s she was captured by Crimean Tatars and eventually sold as a slave in Istanbul into Suleyman’s harem. She quickly became a favorite of Suleyman and, after a fight where she was badly injured, managed to displace one of the Sultan’s other favorites who was exiled with her son, Prince Mustafa, who was the heir (He was eventually strangled after leading a rebellion.). Roxelena became the sole favorite and exerted extensive influence over Suleyman, including giving political advice. 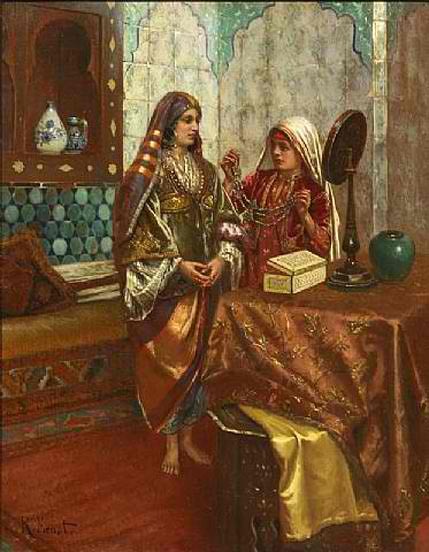 While it was the custom of the Sultans to remain unmarried for political reasons, she was freed and they married. They had five children and her son Selim was named heir.